Do you want save TDS on fixed deposit amount? Well, Fixed Deposits are one of the most preferred investments that people choose. You can describe Fixed Deposit as a financial investment where your money is provided for a fixed term with pre-arranged interest rates. Do you know you can save money on TDS from your fixed deposit account? Here are ways to save it. How to avoid TDS (Tax Deduction Scheme) on Fixed Deposits? 1. 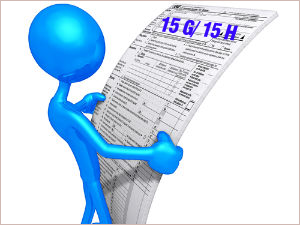 Submit Form 15G/15H – To save on TDS, if you submit the form 15G it means that you have no taxable income. The bank will not subtract any TDS on the interest earned by the customer. If you are a senior citizen, you need to fill up the 15H form. Submit the form in your bank and save money on the Tax Deduction Scheme. 2. Timing the Fixed Deposit – The another way to save TDS on your fixed deposit is that you can time your FD like interest for any of the financial years will not go above 10,000 Rs. Moreover, for example if you are having 12 month fixed deposit of 1 Lakh Rs. at the interest rate of 10.5 % then it can be started in September month. The financial year closes on 31st March 2015. By doing this, the interest will divide in two financial years and TDS will be evaded. 3. Dividing the Fixed Deposit – A customer can open a fixed deposit account under his personal bank account and one more account under the HUF account. However, both will be considered as a separate account. If you have account with HUF individuality, you can split the amount under the two accounts. 4. Distributing the Fixed Deposit Investment – This is the one more way to avoid TDS on your FD account. You can divide the deposit into separate banks like the interest earned by the customer from any of the Fixed Deposits will not go over the limit of 10,000 Rs. These are the best ways to Save TDS On Fixed Deposits. You can apply one of these ways to save the tax deduction from your FD account. Ask a question below in case of any doubt.